And the Arsenal boss believes the Chilean striker will soon rediscover his goalscoring touch. City thought they had a £60m deal in place back in August only for Arsenal to pull out. The Premier League leaders are expected to come back with another bid in January, or to wait until his contract runs out in the summer. But Wenger insisted after his side came from behind to win he will not be worried about Sanchez’s frame of mind at the Etihad. "No, I am not concerned,” he said. “Because I am not suspicious of the performances or the desire to win of a football player. "When you are a football player, you have a social contract with the rest of the team and I never question that. 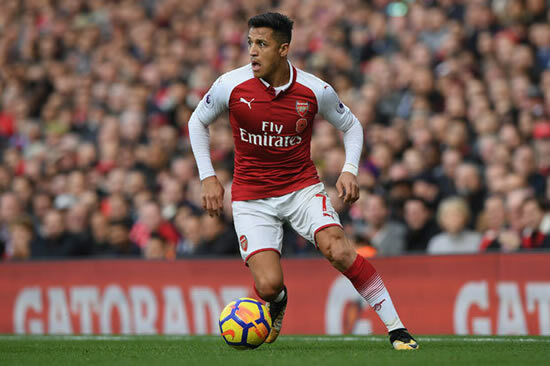 And the Frenchman, who celebrated 800 league games in charge on Saturday, is sure that Sanchez will soon add to his two Arsenal goals this season. "He’s a bit frustrated when he doesn’t score, like all goalscorers,” Wenger added. "I’m not worried about it. He works hard and it will come back quickly. "You can never try too hard. At the moment he’s marked well, (opponents) double up on him, but he still creates many dangerous situations. Sanchez went close with a rasping shot that ex-Gunner Lukasz Fabianski saved at full stretch. But the glory belonged to Bosnian wing-back Sead Kolasinac, who scored the equaliser and created the winner for Aaron Ramsey, his 50th Arsenal goal. But Abraham, on loan from Chelsea, is finding goals harder to come by than he did at Bristol City last season. And he was visibly annoyed when Jordan Ayew had a shot saved by Petr Cech instead of giving him a tap-in to make it 2-0 just before half-time. "Contain your frustration and move on to the next thing as quickly as possible,” said Swansea boss Paul Clement. "It’s going to be a big challenge for him this season. "Not only will he learn things tactically, about the physicality of the Premier League.